This is the Sumatra Mandheling brought to you by Parisi Artisan Coffee. A classic Indonesian flavor profile, with a big body and rustic characteristics, this coffee was sourced from the coffee growing region of Mandheling in Sumatra. This coffee is full bodied with a classically earthy and herbal flavor profile. Entirely too bold and earthy for my tastes....Will probably not use the rest of these beans. I had given up on Sumatra after a few sour tasting brews...this one renewed my faith! Delicious! If you like Sumatran coffees more than I do, you'll like this one more than I did. Very different and intriguing while being perfect for a morning brew. Especially appropriate for fall. Rich, bold, smooth, good flavor overall. This struck me as a very standard Sumatran coffee. It's good if that's what you like, but I think I prefer more citrusy flavors. No particular comments but just didn't care for this one. The herbal flavor isn't too overpowering, but I still needed a lot of sugar and flavored creamer to drink enjoyably. good not great. Finding out that fruity notes are the way to go for me. Still good though. Tastes acidic and burnt. Too bitter. I will try making it with a different ratio, but the dry smell did not impress me either. This one had lots of character. We tried it on the Chemex (Outstanding. The pepper spice over powers the eart and herbal. Paried wonderfully with a monkey bun. ), Hario ( Brought out too much earth for me to really enjoy), and the Clever (Gave a good balance of herbal, spice, and earth). Overall, I enjoyed it, but my friend Kent didn't care for it. This one was truly outstanding. Strong, not bitter or sour, this has come to define what a good cup of coffee should be. Loved it. Jess's favorite coffee so far. This was the one bad coffee we have received from Mistobox. I hate complaining, but I suppose it's good to point this out so we don't get more with this flavor profile. Loved this, rich, smooth, yes, earthy. Terrific! Legitimately made me pause while drinking and say “Damn that’s a good cup of coffee”. Probably my favorite coffee so far - earthy and bold, low acidity. roast is too dark, too French roasty for me. Good coffee, but definitely tastes like an Indonesian. Not typically my first choice as I tend to go for single-origin Ethiopians when purchasing my own coffee. a bit bitter/astringent. acidity also too low. similar notes on other indonesians, maybe need to try a different region. I mean, I'm not going to throw it away (barely), but apparently "herbal and earthy" are not my cup of joe. Yuck. Please send me more coffee with chocolate/ caramel/ brown sugar notes! Far too earthy, bordering on roasty. This coffee lead me to change the roast profile from medium to light. Full bodied flavor and easy to drink. Good for an every day coffee. This is deliciously dark and nutty. It's very bold but is still easy to drink--it didn't feel like I had to sip it carefully, as I sometimes do when I have something really bold. I loved the contrast of it with fruit-filled oatmeal in the morning. I've started using an AeroPress and all coffees are tasting better. That said, this is a nice bold blend but the herbal notes are almost a bit too subtle for me. Still, it is a very enjoyable morning cup. Absolutely fantastic coffee- maybe my favorite of everything sent so far. A little too bold for my tastes. Seemed maybe a little too dark and bold for me. I did not like this bag. It was no better than a $5 bag of coffee from the grocery store. Sorry but this was very underwhelming. Too earthy for our tastes! Roast is a little too traditionally dark for me. Fewer fruit flavors come through. Needs to be brewed hotter and longer to balance out the somewhat typical carbonic flavors. A good coffee but nothing overly special about it. This coffee smells great. I wish the bag was larger. Very earthy but not dirty. A good autumn rainy day brew. Very distinct flavor. Enjoyable to drink for breakfast. I liked this coffee more then the first one. It was a little bolder, but still on the mild side. The scent of the beans was a little to mild and herbally. Overall I thought the coffee was smooth and balanced. But I was a fan of how light and herbaly it was at first. It finished nice, but the first burst of flavor was to light. Other then that it was a good coffee. Better then the first, but still room to work out my flavor profile. Thanks. I look forward to your next selection. writing this weeks after... so don't recall the details. mmmm! We love this one! Full of flavor and a great way to start our day. Best coffee I've had from Mistobox. Smooth, rich, perfect. Coffee is very dark, tastes burnt. This is a great sumatra, not too dark compared to others. Another good one. Haven't had any I didn't like. We are moving in the right direction. This will be the one to beat, so let's keep trying. Another good cup of coffee, but like something darker. It was good but not too remarkable. Way too sharp and acidic. My favorite MistoBox coffee to date. I tried this coffee using both the French Press and Moka Pot. The Moka Pot definitely produced a superior cup. I love the bold, earthy, herbal flavors. The roast is spot on! Please send more similar to this. Straight to the trash. This stuff is foul. Rancid tang. More of a medium than I was expecting. But great flavor and profile. Seth Mills, I do not understand why I have such a problem with this coffee. I brewed two pots trying different grind and strength but it tastes bad. Starbucks Sumatra is on of my favorites either as beans or K cups. Hope the next selection is better. I can return most of this bag if you wish. Not a fan. Light roast is more of my profile. Good brew; no acidity; more body than suggested in the bag blurb. Earthiness does come through and suits our Northeast woodlands taste for coffees. I've really enjoyed this slightly darker roast. The flavor it releases are different than the lighter roasts I have become accustomed to. I look forward to continue trying medium to darker roasts. Sumatra Mandheling has long been a favorite of mine, and this bag was an outstanding example. Having some experience with the bean, I had some fun playing with ratios and brew methods. Towards the bottom of the bag, I made a pour-over cup with a rinsed paper filter, 1oz of med-fine ground bean, & 15oz of 205deg water. 90sec bloom, about 5 min total brew time. Yielded probably the best cup of coffee I've ever had. Rich, full, velvety smooth, great acidity, full-bodied earthy bouquet. Three stars, simply because I'm a dark roast kinda guy. Having said that, if I wanted to keep medium roast on-hand...this would be the one. Smooth and silky, balanced acidity (unlike some medium roasts, here's looking at you ritual), mild but satisfying finish. I usually aeropress, but in my uneducated opinion this one holds up very well via drip. Family recently visited and it was nice not to have to hand-press every cup...drank several pots of this course ground and dripped, and got several compliments as well as enjoying it myself. The coffee is good (even though it is not of the roast that I had signed up for Medium vs Dark). It is exactly what the bag says and has a really smooth finish. Super rich and almost velvety. Love the earthiness and crema of this brew in a French press. I wanted to like this more than I did. Tasty enough. Local roaster. But I found myself not finishing the cup, surprisingly. ... You sent it again in June, '18, and I like it more. Upped the stars to 5. A little darker than I like. it's so far the best sumatra i've had. not too much herbal notes and yet very rich in taste. I liked it a lot, the aroma is fantastic, no bitter aftertaste. Overall great start and I would recommend it. I might prefer a tad darker but that's if I'm trying to be picky . A fine coffee with good body, but a tad bit too earthy for my liking. Thanks! It wasn't as sweet as the description on the bag sounded.. But that was a good thing! Very tasty. Not a huge fan. There was a tobacco and smoky flavor that is not as enjoyable as some Sumatran's I have had. Still excited about the next one though! It has a big aroma from the bag. The taste is peppery and savory. It's almost like salted peanuts. I'm not a huge fan of this one. I prefer the flavor to be on the sweeter, chocolatey side. The aroma however, is outstanding. It was less bold and lighter in color than we usually prefer. I liked it, but found some of the almost citrusy notes to be a little strange. My wife didn't like it very much because the flavor might have been too acidic and the after-taste wasn't pleasant. Sumatras always teeter on the edge between earthy and dirty, and I found this one slightly dirty. In fairness, most are, and this one was relatively clean as far as Sumatra coffees go. It was roasted well. 4 stars among Sumatra coffees, 2 stars among the rest of the world. Bright, strong flavor with notes of citrus fruit. Great coffee. First order and very pleased. Flavor as described and aroma very nice. 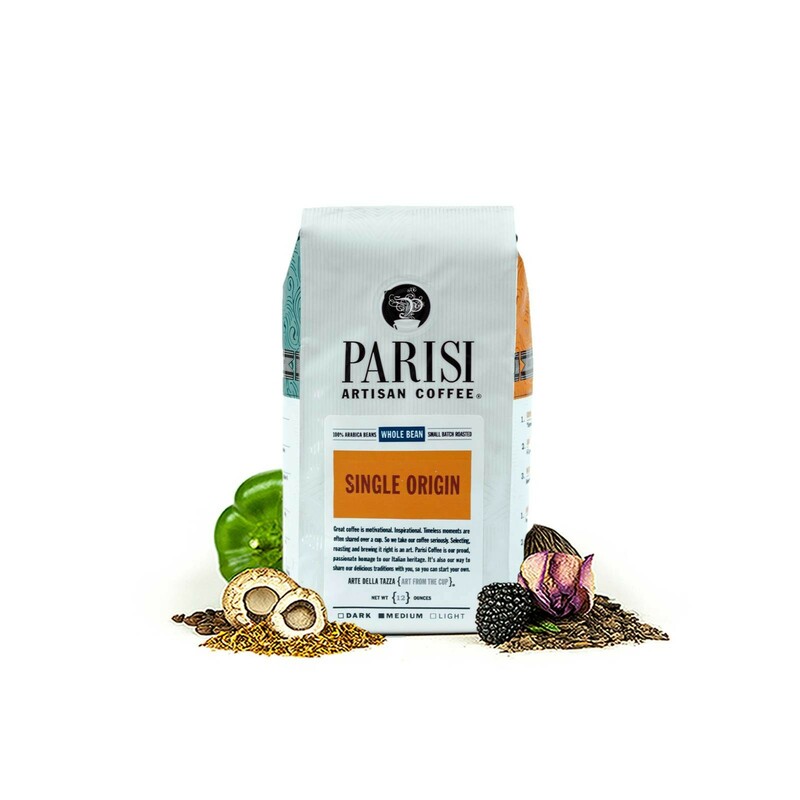 Great intro to single origin. Very mild (very far from the "bold" as described). Bitter aftertaste. Very disappointed. Too earthy for us. Prominent dirt flavors. My husband loves this coffee because it is so different. Very crisp and bright for an Indonesian bean. I dig it. Did not enjoy this coffee. I selected dark roast, bold espresso blends and this did not fit that profile. I was disappointed in this selection. Not too bad. Was not as dark or full of flavor that I was anticipating but I wouldn't mind having another cup!